Buy The most advanced Soya bean oil machine (Manufacturer with ISO,BV and SGS) - Shandong Microwave Machinery Co.,Ltd. Introduction of The most advanced Soya bean oil machine (Manufacturer with ISO,BV and SGS)low-temperature-press (LP), high-temperature-press. 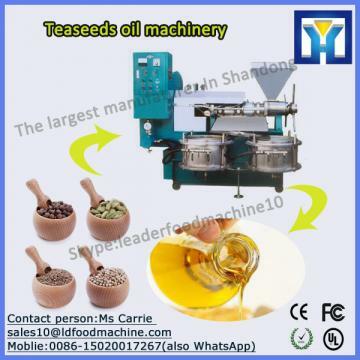 one can sell The most advanced Soya bean oil machine (Manufacturer with ISO,BV and SGS) while pressing at the market. (1) The most advanced Soya bean oil machine (Manufacturer with ISO,BV and SGS)Refining section: used to P-acid de-gumming, alkali refining de-acid and water rinsing. (5) The most advanced Soya bean oil machine (Manufacturer with ISO,BV and SGS)Heattransfer oil stove: supply each device production needing heat energy, temperature reach above 280°C. (7) The most advanced Soya bean oil machine (Manufacturer with ISO,BV and SGS)Vacuum pump: supply needing vacuum for dehydrate, de-color, de-odor. Vacuum degree can reach above 755mm Hg. (9) The most advanced Soya bean oil machine (Manufacturer with ISO,BV and SGS)Air compressor: blow dry bleached clay, blow empty the leftover oil in the press filter. Our soya bean machine is TOP 10 oil machine brand product, we adopt advanced processing technology to process soybean into edible soybean oil.Our factory is located in Huaxian Industry Zone, covering an area of 10 hectares.We are a large-scale oil machine manufacturing enterprise integrating R & D, Design, manufacture and installation. We are outstanding membership corporate of Chinese Cereals and Oils Association, an authoritative organization in edible oil and oil machine field. We abide by contracts and keep promises, win good reputation from customers.We have the most complete production certifications and have the strongest production strength.We have obtained 26 patents, 6 internatioanl awards, 2 national awards and 2 provincial awards. If you want to learn more about soybean oil machine, pls contact us through skype at beata--hhcome or 15837228314. Shandong Microwave Machinery Co.,Ltd.is a Teaseeds oil machinery factory specializing in the production of The most advanced Soya bean oil machine (Manufacturer with ISO,BV and SGS), scientific research,manufacturing,installation, commissioning.Shandong Microwave Machinery Co.,Ltd.can provide Teaseeds oil machinerycustomers with design and services of 1-2000 tons The most advanced Soya bean oil machine (Manufacturer with ISO,BV and SGS). Shandong Microwave Machinery Co.,Ltd. have finished hundreds of successful projects Teaseeds oil machineryover the years: peanut oil, soybean oil, rapeseed oil, cottonseed oil, sunflower oil, sesame oil, animal oil,grape seed oil, acer truncatum oil, peony seed oil, walnut oil, hemp seed oil, pine oil, tea seed oil, papaya oil, milk thistle seed, and other special type Teaseeds oil machineryoil. Shandong Microwave Machinery Co.,Ltd. have independent import and export department. Shandong Microwave Machinery Co.,Ltd. Teaseeds oil machineryequipment has been successfully exported to more than ten countries: Russia, Australia, India, Afghanistan, Cameroon,and so on.